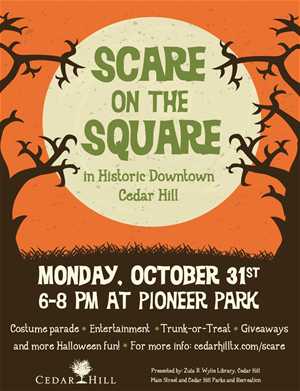 Bring the whole family for the annual Scare on the Square in Downtown Cedar Hill. There will be a costume parade, trunk-or-treat, entertainment, and more Halloween fun! Visit cedarhilltx.com/scare for more details. Sponsored by Zula B. Wylie Public Library in Cedar Hill, Texas, Cedar Hill Parks and Recreation Department and Cedar Hill Main Street. Ghosts, ghouls, and goblins invade Historic Downtown Zula B. Wylie Public Library presents Scare on the Square. The frightful fun will feature creepy tales performed by master story tellers, activities in the park,trunk or treat and trick-or-treating with participating downtown merchants. Admission to the festival is always free to children accompanied by a parent or guardian. Guests are encouraged to arrive on time for the storytelling. If you have questions regarding the event contact Theresa Brooks at 972.291.7323.